Pennisetum setaceum, or Purple Fountain Grass, is one of the most popular ornamental grasses due to its striking dark foliage color and texture. This grass works beautifully when used as a specimen, in groups, or even in containers in a variety of landscape styles. The arching purple-red foliage quickly grows to 3- to 4-feet tall and make clumps that are 2- to 3-feet wide. Its fast growth rate makes it useful even as an annual in regions where it is not winter-hardy. This grass produces impressive red inflorescences reaching up to 12” in length. The fuzzy plumes hang on the stems well into the fall and fade into a slightly tannish-red color as winter approaches. Purple fountain grass thrives in a variety of landscape settings, but good soil drainage is a must. Amend soil for improved drainage. In warmer regions with mild winters, this fast growing grass can often perennialize. When growing in warmer regions, cut grass back in late winter before the new foliage emerges to keep plants looking fresh for the spring season. 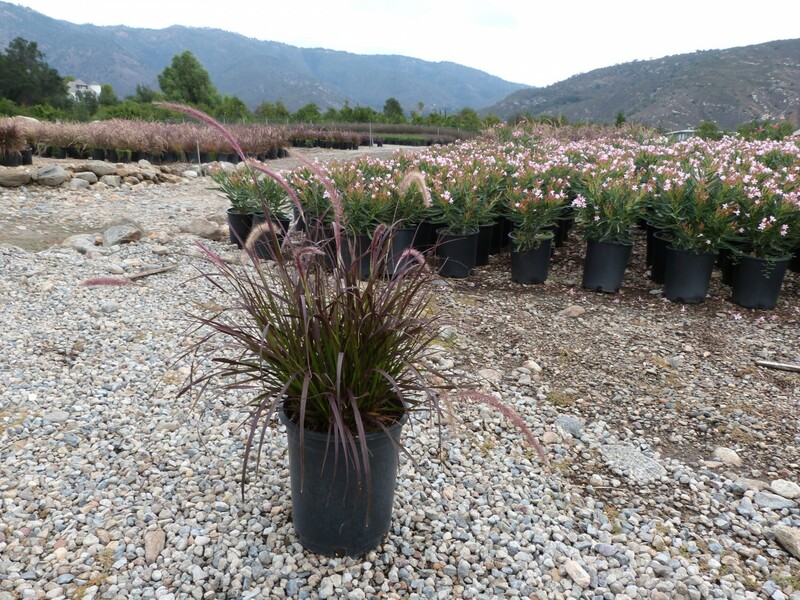 Purple fountain grass performs best in a full sun location but it can tolerate a small amount of afternoon shade. Keep in mind that planting in too much shade causes loss of foliage color and weakened plant vigor.